VTech are a company with a particular interest in cordless technology. We have accredited 2 of their phones, the VSP726A and the VSP608A. With Vtech you get a lot of features for your money. Both phones have DECT built in (for different reasons which will be explained below). 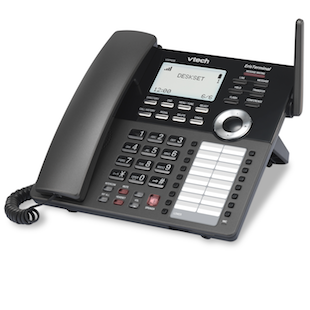 This is a good entry level phone which competes well with a Polycom VVX 201. Whilst the Polycom has slightly better audio quality, the VSP726A has more features which include built in DECT and busy line indicators. This phone can be paired with a VSP500A (cordless headset) or VSP601A (cordless handset). As the phone has built in DECT, this makes this phone, when paired with a VSP500A, the simplest and most cost effective solution to get a DECT headset on your desk. The VSP608A is the only business desk phone on the market (that we have found) which is DECT based phone. Unlike the VSP726A which has DECT built in so that you can have a DECT headset or a handset paired with your phone, the VSP608 uses it’s built in DECT to connect to a DECT base station. This makes this phone a solution for rooms or locations in the office where a network point is not available. There are phones available which use Wifi to connect, however DECT has much better range and suffers less with quality problems. This phone requires a DECT base station to work (VSP610A). The VSP610A plugs directly into your network and is usually powered by PoE (power from the network). Our main gripe with this phone is you cannot pair a DECT headset with it. The VSP610A is a good little walk about phone. There are always occasions when you have staff which move around the office. This DECT basestation and handset is one of the few with a transfer button as well. 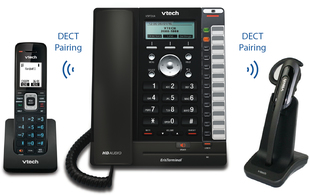 When you purchase a VSP610A you get 1 handset with it also. Each base station can support up to 4 phones. Provisioning a VTech phone is now even easier, these phones have received babblevoice Full Accreditation + ZTP - which means you can configure from the babblevoice console without even touching the phone. See Zero Touch Provisioning for more information.